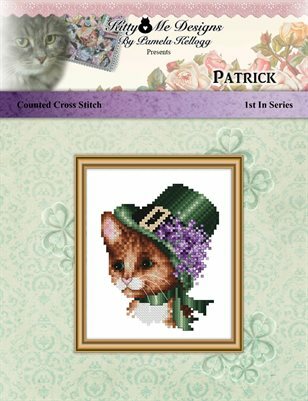 Patrick, the Irish Ginger Cat, wears a beautiful green St. Patrick's Day hat adorned with pretty purple violets. This cross stitch design has a stitch count of 46 stitches wide X 58 stitches high. On 28 count Evenweave over 2 fabric threads or 14 count Aida, the finished stitched area will be 3 1/4 inches wide X 4 1/8 inches high.